Mm mmm'mph mrph mm mmrrr! If you are reading this, then I must first claim that I am not responsible for any loss of hair or sanity as a side effect of your literary tastes. But more importantly, I wanted to suggest an idea for consideration for the upcoming (someday) “Meet the Pyro” video. 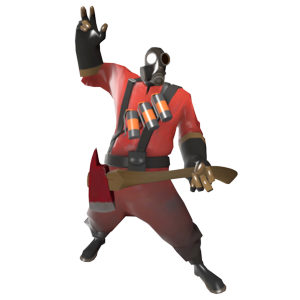 Why not make “Meet the Pyro” a music video? This would skip over the difficulties in narration for Pyro and give a great backdrop to show off the Pyro’s skills and abilities. And it preserves the Pyro’s mystic. As a matter of fact, I could think of one particular song that not only fits the Pyro, but also kind of touches upon the whole concept of where Team Fortress 2 has been and where it’s going. That song being Billy Joel’s “We Didn’t Start the Fire“. I understand if this cannot be done because of difficulties obtaining the rights to the song. But TF2 has been around for some time and if this is the last video coming out for the classes, I figure why not go out with a fiery bang? What has two thumbs and writes sincerely? This entry was posted in Musings and tagged Billy Joel, Meet the Medic, Meet the Pyro, Pyro, Team Fortress 2, TF2, Valve, We Didn't Start the Fire. Bookmark the permalink.